CAOC's Amicus Curiae Program is a critical part of our advocacy work. The program is a positive influence on the development of case law in a way that helps all Californians. CAOC's Amicus Curiae Committee is comprised of some of the top appellate attorneys in the Plaintiff's bar. Our well written briefs and letters serve to help bring into focus the specific points of law in cases that are of key concern to our members. 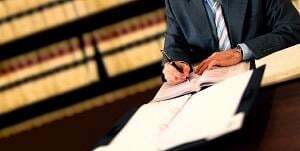 As a general rule, CAOC tends to focus on cases that have been accepted for review by the California Supreme Court. The Amicus Curiae Committee will also consider authoring or co-authoring briefs in cases of significant importance at the state court of appeal and the federal appellate system. To submit a request for amicus assistance, please click here (pdf). If you are a CAOC member and would like to be considered as a candidate for the Amicus Curiae Committee, please click here. Amicus brief filed with the Supreme Court of California on December 28, 2017 by Sharon J. Arkin. Request for depublication filed with the Supreme Court of California on September 28, 2017 by William Turley. Request for depublication filed with the Supreme Court of California on September 1, 2017 by Valerie Tallant McGinty. Request for depublication filed with the Supreme Court of California on July 24, 2017 by William Turley. Request for depublication filed with the Court of Appeal, First Appellate District, Division One on June 23, 2017 by Alan Charles Dell’Ario. Co-amicus brief filed with the California Employment Lawyers Association (CELA) with the Supreme Court of California on June 9, 2017 by Kimberly Ann Kralowec for CAOC and Ari J. Stiller-Shulman for CELA. Amicus brief filed with the Court of Appeal, First Appellate District, Division One on May 2, 2017 by Sharon J. Arkin. Amicus brief filed with the Supreme Court of California on April 10, 2017 by Gretchen M. Nelson.